Looking for a fun and challenging night out with friends or colleagues? 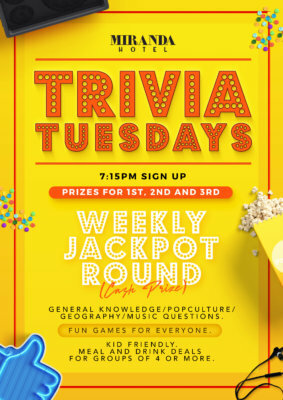 Well Miranda Hotel is once again offering free Trivia every Tuesday nights from 7:15pm. We have awesome games, variety of questions and various prizes. There are prize vouchers for 1st, 2nd and 3rd place PLUS a 3 question jackpot round with a cash prize that increases each week until won. The questions range from current events, pop culture, music, geography, sport and general knowledge. Grab your smart friends, create your team, and join us for an evening of fun.